A few weeks ago I stumbled upon the old BBC television show “The Office”. I’m always watching these old television shows way after they’ve been off the air and nobody else cares. The DVDs were at the library and I figured why not give it a try. The first episode put me in a state of shock, but I had to keep watching. Often I found myself yelling at the characters, “PLEASE STOP TALKING! OH PLEASE, UNNGUH! oh please stop,” and then hiding my face behind a pillow. I made my husband watch it with me because I was afraid to watch alone. I love this train wreck of a show. We’ve watched the complete series (mercifully short , only two seasons and a special/finale) more than once. I see bits of myself in practically every character (which totally makes me squirm). I can’t say I’ve ever watched anything that moved me to equal measures of hostility and ultimately compassion. The actors are great. They have such wonderful faces that I had to draw them. Here are two drawings that turned out. 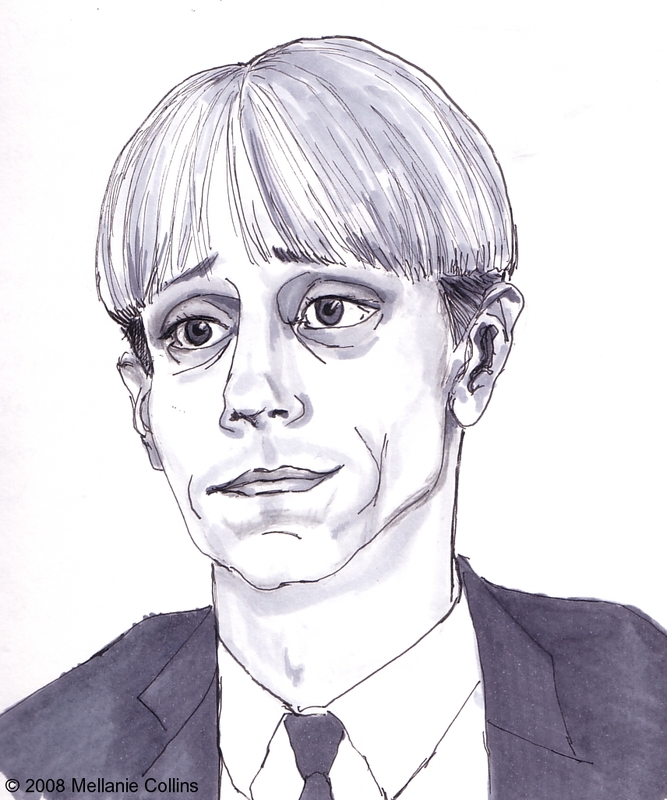 The drawing above is Mackenzie Crook as Gareth Keenan: team leader and survivalist. 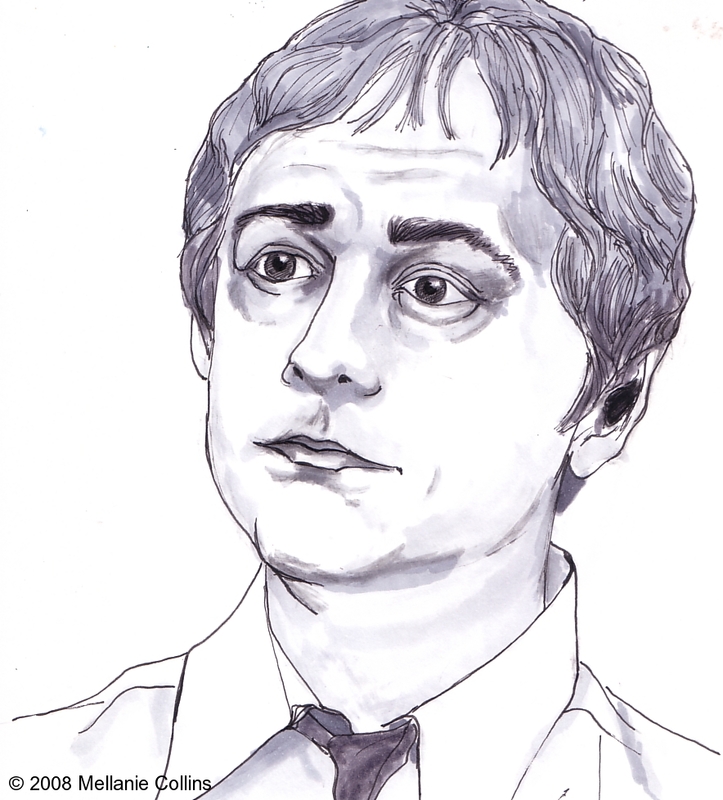 The drawing to the left is Martin Freeman as Tim Canterbury, sales clerk and classic underachiever. The drawing was a fun exercise. There was lots of messy, ugly pencilling and then a 005 Micron marker and cool gray Copic markers. I just can’t do ink washes. I can’t even try. I just won’t. I like the clean look of these. But I think that’s because I know what the messy pencilling looked like before I erased it. Thanks for stopping by! I should have more drawings to post soon. This is a non-commercial site and the images in this post were produced for my personal education and enjoyment. It only seems like Yesterday the Office was on TV. I thought it was great, and I have yet to see anything that is as funny in recent years. The US version is nowhere near as good. I very much enjoyed your drawings too, have you done one of “David Brent” yet? I recognised these two immediately, although frankly I think your drawings are flattering to both of them 🙂 I’ve never used Copic markers before but you have achieved some remarkably sensitive shading with them. I’ve wondered, since seeing a couple of episodes of the American “Office”, whether its comedy value for a US audience equals that of the UK version for us … The scenario has been skilfully translated, I think, but it’s tricky for me to “get” the characters in quite the same way. Brent’s equivalent seems less cringe-making. I never watched the show and don’t know the characters – but I think your face drawing skills are amazing. Love the gray Pitt pen for shading. Great drawings! I really like them! Thanks everyone! I am glad you like the drawings. I’ve been working on a couple more. I haven’t seen the US version of the show. I don’t think I want to. I can’t imagine that it could be as good as the original. Thanks for all your comments. I cherish every one. These portraits are excellent. I especially like the one of Gareth. I thought the Office was one of the best series I have seen in a very long time. The acting ability and superb timing of the cast was phenomenal. Like you I cringed more than once with embarrassment but that didn’t stop me getting both series on DVD. I think it was a masterly stroke by Ricky Gervais to end it after such a short time. It kept it fresh and memorable. I have seen one episode of the US version and there was no comparison. I think their type of humour is not right for it to work successfully. Anyway, great drawings here. Would like to see David Brent and Dawn. Nice work on those two. I want to see you draw Dwight Schrute from the NBC Office show. He is a nut. Glad you guys liked the drawings. It was fun to do. I agree with Cathy that making the show such a limited series was great judgement. I just ordered the shows on DVD. I have a few more drawings in this style coming up. Question: Does anyone know if there’s a family relation between Gareth Keenan and Elizabeth Garvie (Jane Austen’s ‘Elizabeth Bennett’, 1980)? The likeness between them is rather too strong to be coincidental! Brother and sister, maybe? Pingback: Welcoming 2013 With New Confidence – See. Draw. Share.